MCB Pre-Health and Professional Mentorship Program, Formerly "MCB Pathways to Health Careers"
The MCB Pre-Health and Professional Mentorship Program began as an opportunity for students interested in pre-health careers, but it has grown to include alumni mentors in areas of research, biotechnology, and other related professions. The program connects undergraduate Biology, MCB and Biochemistry students with alumni already practicing in the field. It is available to declared Biology, MCB and Biochemistry majors only. This program received the 2013 IlliAAC Outstanding Established Program Award and was recognized in an article published in the December 2015 LAS Alumni Magazine. Initiated in 2010 by alumnus Richard Berkowitz, MD ('79 Biology) and Tina Knox, Coordinator of Undergraduate Instruction ('92 Biology), the program has grown to include more than 100 UIUC Biology alumni. Each fall, The School of MCB hosts a panel of alumni, who share their story and answer any questions students might have regarding career preparation in healthcare or another MCB-related profession. This event serves as a kick off for the alumni mentorship program. The 2018 alumni mentorship panel and reception will take place on Thursday, October 25 from 5:30 PM to 8:30 PM. Please watch this website for further information about this informative event and a link to RSVP. 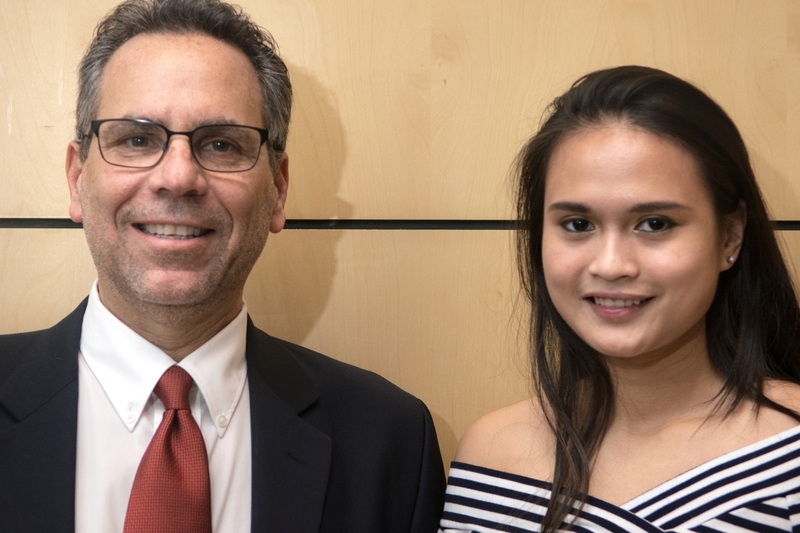 Pictured here are Dr. Berkowitz and one of his mentees, Pha Thaprawat, May 2017 MCB graduate. In order to be matched with a mentor, students in Biology, MCB, and Biochemistry must apply to the program. The application for the 2018/2019 academic year has closed. Note: you must use your illinois email address and log-in credentials to access the application. Students wanting to learn more about this opportunity should read, A Letter to Students, or watch this video by Dr. Berkowitz. Applications for the mentorship program will be evaluated by MCB instructional staff, who will then rank applicants based on year in school, area of interest, GPA, and goals for the experience. Ideally, students chosen to participate in the program will be paired with a mentor based on their specific career goals and geographic location. We will match as many students as possible, based on mentor availability. We encourage mentors to provide one or two shadowing opportunities per year (if possible) and to keep in touch with their student(s) via phone, email or Skype/Facetime during the rest of the year. Mentors can provide students with valuable information regarding health professions, industry-based professions and other exciting biology-related careers. Mentors may also provide advice on the application and interview process for professional and graduate school. In return, our students keep the mentors connected to the University and to the School of MCB. There are currently over 100 participating mentors in various professions and geographic regions, and the program is always looking to recruit new members. If you are interested in becoming an alumni mentor or would like additional information please contact Brady Hughes or see A Letter to Alumni, written by Dr. Berkowitz.